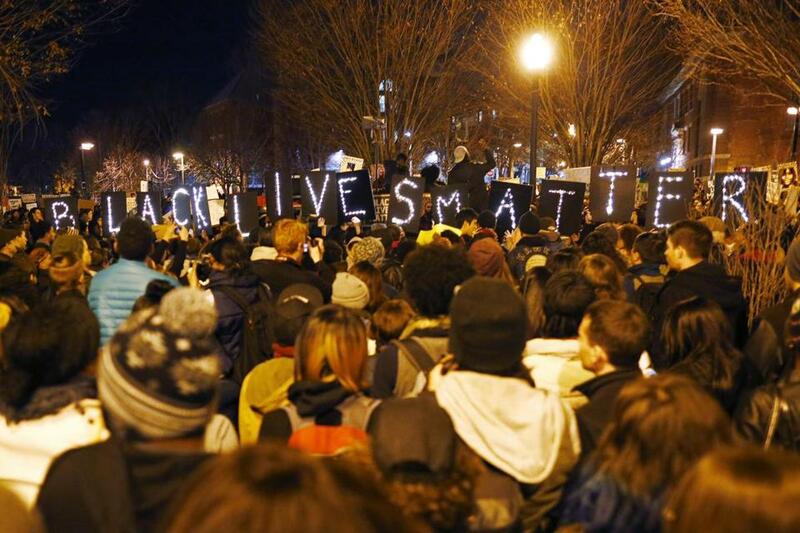 Demonstrators held lighted signs spelling out “Black Lives Matter” during a protest in Boston. Institutionalized racism and white supremacy are toxic for all people of color. But the “black” in “black lives matter” calls our attention to a related, but distinct, force that produces more deaths like Trayvon Martin’s and Michael Brown’s: Anti-blackness. Racism is a combination of prejudice, discrimination, violence, and institutions that reproduce racial inequality and injustice, regardless of intent. Our schools, neighborhoods, and criminal-punishment system actively privilege whites at the expense of people of color, even when the rules governing these systems are racially “neutral.” Anti-blackness entails all this and more. It is not simply about hating or penalizing black people. It is about the debasement of black humanity, utter indifference to black suffering, and the denial of black people’s right to exist. Focusing on anti-blackness rather than just racism is sure to make some people uncomfortable. A recent study finds that the word “black” is more closely linked to stereotypes and negative emotions among white people than the phrase “African-American.” This not only demonstrates that thinking and talking in racial, rather than ethnic, terms has political implications, it shows that the mere idea of “blackness” generates disdain. If talking about racism is polarizing, talking about anti-blackness is completely taboo. But America needs to face the truth. How does thinking in terms of anti-blackness help us move forward? First, anti-blackness more accurately captures the dehumanization and constant physical danger that black people face. The “anti” in “anti-blackness” is denial of black people’s right to life. Black humanity is desecrated in plain view, as Mike Brown’s dead body laid uncovered on the street for four and a half hours before being unceremoniously hoisted into an SUV. Brown is described as “it” and “a demon” in his killer’s testimony, and killing black people is all too frequently rewarded, as George Zimmerman and Darren Wilson raised hundreds of thousands of dollars in defense of their actions, and Wilson remains employed. Martin and Brown’s deaths are proof that for black people, walking home is risking one’s life. Akai Gurley’s death is proof that entering a dark stairwell is risking one’s life. Marissa Alexander’s failed invocation of “Stand Your Ground” laws is proof that black self-defense is an oxymoron. In the most basic sense, black people are not safe. Second, as Ta-Nehisi Coates, Patrick Sharkey, and others emphasize, the problems poor black American communities face are problems of a different kind, not scale, when compared to other disadvantaged groups. They are: the overlay of class and race segregation, persistent unemployment, the near complete absence of social mobility across generations, wildly disproportionate punishment and incarceration, and pulverizing social isolation. Sociologically speaking, black suffering has no parallels in contemporary America, but it is not regarded as a national crisis. Anti-blackness captures this erasure of black life and the collective refusal to acknowledge the injustice. Third, anti-blackness has political implications far beyond standard American conceptions of race. It is tied to white supremacy, but it is not only practiced by white Americans. Anti-black ideologies are adopted on continents half way around the world, as black labor is abused and black migrants and workers are regarded as social pariahs. Within the United States, courageous thinkers like Junot Diaz who belong to non-dominant ethnic groups are increasingly attuned to the ways anti-blackness and color privilege echo through their communities. Many who engage in anti-blackness are aware of the ways racism shapes and constrains their lives, but awareness does not prevent them from engaging in anti-blackness themselves. And finally, when well-meaning people shy away from discussing anti-blackness, they cede the discussion to people like Rudolph Giuliani, who suggest that black people are exterminating themselves, and “black crime” is the root cause of black suffering. Anti-blackness is already part of the public discourse. We saw and heard it in the dehumanizing anti-Obama posters and slogans during the presidential elections in 2008 and 2012. We can read it in the comments section of articles about Trayvon Martin and Michael Brown, and on Twitter, as everyday citizens mock “Hands up, don’t shoot!” by tweeting, “Pants up, don’t loot!” We can no longer ignore anti-blackness. We must name it, and meet it with equal force. Calling attention to anti-blackness does not diminish the oppression that other groups face, nor does it produce petty competition over which groups have suffered the most injustice. It is simply speaking the truth. Protesters know this, and their loud and unabashed condemnation of anti-blackness has fueled their fire and increased solidarity, as demonstrations are carried out by people from all backgrounds and walks of life. Chants of “black lives matter!” have not weakened the critique of institutional racism; they have strengthened it. And if we are to survive, they must grow louder.